Giving new parents less to worry about. “Normal” is a loaded term. It suggests that one thing is better than another. In newborn babies, what is normal? And what does it mean for a child’s development if he is different from that standard at birth? Do parents and pediatricians need to fret about it? Dr. D. Wayne Mitchell studies these differences. 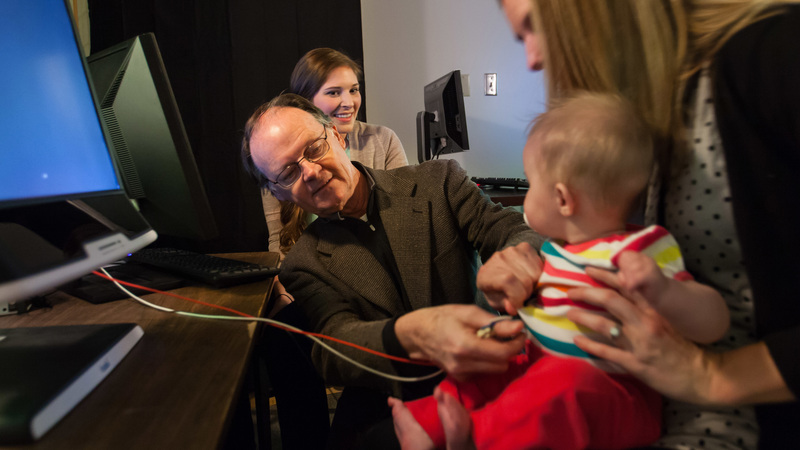 Using data he and a team of scientists collected, Mitchell is working to establish a connection between standardized test scores and laboratory measures of visual learning in infancy to later developmental outcomes. In the 1970s, the late Dr. T. Berry Brazelton developed the Neonatal Behavioral Assessment Scale (NBAS). In the U.S., many infants undergo this testing within hours or days of birth. Mitchell, associate professor of psychology at Missouri State University, admires Brazelton’s contributions but sees a flaw with the scoring of the scale. Brazelton developed the scale and a “best” response rather than a range of acceptable responses. Mitchell argues that a range could still be considered healthy and normal. He also believes a range would allow for better predictions about which infants may be at-risk for subsequent developmental outcomes. He worked with a team at the University of Kansas Medical Center in the 1980s testing more than 1,300 newborns using the NBAS and other scales. More than two decades later, he has compiled the results to develop a thorough range of acceptable responses. This will help those who administer the test and will be a tool to develop alternative scoring methods. The scale contains 28 behavioral and 18 reflex items. The scale is used to assess a baby’s visual and auditory capabilities as well as temperament. In previous studies, he recorded how long an infant looked at an object. The infants were then classified as being a long- or short-looker. Based upon his and his colleagues’ work, short-looking infants tended to process more information and process faster than long-looking infants. Infants who displayed shorter looks tended to have higher childhood cognitive and language skills. He continues to study how infants respond to stimuli and relate it to future developmental outcomes. One of his ongoing studies has to do with the age-old question: What’s more significant – nature or nurture? Mitchell investigated the visual scanning patterns of a small set of parents and their respective infants – half of which were adopted. “Whichever child you looked at, their visual scanning was almost identical to the parent,” said Mitchell. At the same time, he is testing the reliability of his studies and gaining larger sample sizes. Creating and employing more reliable measures should give insight into how these behaviors during infancy relate to those observed in later childhood.